Hands down, one of my biggest beauty frustrations is my super dry lips. No matter how much water I drink or what products I use they still seem to be an issue - making it hard to wear matte lip colors. For a long time I've sworn by the Elizabeth Arden Eight Hour Cream - which has worked the best out of any other balms I've tried so far. Until...I was introduced to Sara Happ at Nordstrom the other weekend and tried out some of her line. 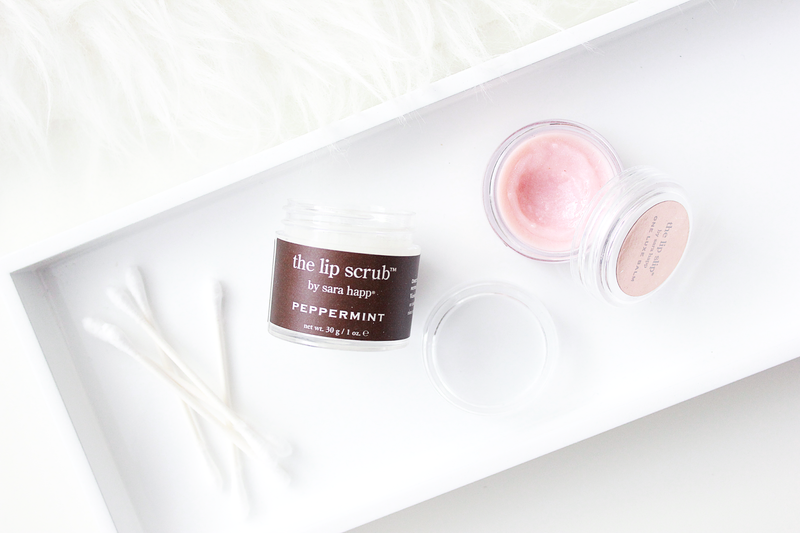 The Lip Scrub 'Peppermint' : This lip scrub not only smells delicious (and taste good) it works really well at scrubbing away dry/dead bits of skin. After my skincare routine in the morning I'll work a bit of this into my lips and then top with balm. This combination makes applying lip color super easy. The Lip Slip, Lip Balm : This is definitely the standout product of the bunch for me. Unlike many lip balms which can dehydrate your lips and leave them craving tons of product application, this stuff actually lasts ages. It also leaves them soft and I never get that dry/burning feeling I've gotten from others once they wear off. The best part of this balm is how it works overnight. I always put this one right before bed and in the morning I'll wipe it off and bits of dry skin will come with it - so it's working overnight to totally smooth out my lips. The Lip Slip also serves as an enhancer to your natural lip color. It has a barely there pink tone with bits of shimmer that bring out the color in your lips. Making it the perfect natural, addition to simple makeup or even a smokey dark eye. Have any of you used any of the Sara Happ line before? I used to follow her on her social media and then I kind of lost track of her. The scrubs and balms look super lush and I want to try them out! I've never heard of the Sara Happ line before, but I do love a good lip scrub! Both of these sound lovely. I'd not heard of Sara Happ before, but i'll have to keep an eye out. I've heard good things about this line but I've never tried it. I love a good lip scrub, I'm currently using one from Bite Beauty. They are wonderful! I got to meet Sara the other weekend and she is incredible, definitely an inspiring story how she got started too! The flavors are awesome, she has a bunch so there is something for everyone! This one is great, I actually prefer it to the Fresh Sugar Scrub! She's fantastic - they sell her products in Nordstrom (if you are close by to one) or you can always order online! Too funny, I've never tried Bite but heard great things about their products! I'm dying to get a few of their products though! I haven't tried anything from the line before, but It seems to be fabulous, I'll definitely have to give these two a try! They sound like the perfect prep duo. I haven't tried Sara Happ, but I've heard great things! I suffer from dry lips, but I like to use coconut oil or almond oil on my lips to moisturize them. I find that it works the best for me. I might just have to check both of these products out though!